As house sizes increased steadily through the latter decades of the twentieth century, so did the garages that accompanied them. Not only did traditional one- and two-car garages grow in size to accommodate the heftier vehicles they had to house, but the number of bays in garages increased from one to two to three, and even more. It soon reached a point where the typical garage in a new housing development had the same square footage as the average new house of a few years earlier. Whether you applaud or deride this super-sizing of residential housing and consumer automobiles, making an older, smaller garage with smaller doors accommodate modern larger vehicles is a very real problem for many consumers. The first car garage may have been created somewhat accidentally. Legend has it that Henry Ford built his first "horseless carriage" in a neighbor's coal shed in Detroit in 1896. Though Ford was clearly a visionary, he was somewhat blind to the immediate future—after building his prototype, he discovered that it was too big to get through the door of the shed. Ford improvised; he knocked out enough of the brick wall to let his new creation pass through. Within a few years, horseless carriages were being cranked out in the hundreds, then thousands, on assembly lines. And not long after that, carpenters found a new market to build tiny garages to store and secure the new automobiles. Of course, domestic vehicles have long since outgrown those garages. When you see one of these original garages now sitting near an old home, they look quaint but are generally used to store only bicycles and motorcycles or are serving as garden sheds. If the owner has a modern car, it's likely there is another garage on the property that is sized to accommodate larger vehicles. You might be surprised at the range of standard sizes that exist today for garage doors. Leading garage door manufacturers typically sell doors in widths ranging from 8 feet to 20 feet. Smaller sizes can be found; for example, in areas where golf cart transportation is popular, garage doors are usually available to suit these small vehicles. In large suburban or rural properties, such garage doors may serve large riding lawnmowers or small garden tractors. The smaller standard 8-foot-wide doors are not being installed in many new houses these days, but there are still plenty of older homes with garages built to house smaller cars. Replacement garage doors are readily available for these homes. Standard heights of garage doors are more limited. Usually, they are offered in heights of 7 or 8 feet. If you are having a new garage built, there's a good chance that the builder will suggest a door 9 feet wide and 7 feet high—assuming you are planning one door for each vehicle in the garage. That's a good size for most of us, but what if you happen to have a large truck, with large mirrors projecting from the sides or a snowplow on the front? Many such trucks have lost those mirrors trying to squeeze into a 9-foot-wide opening. In this case, you might want to give serious thought to going with doors 10 feet wide doors, and perhaps increasing the height to 8 feet. The garage, of course, will need to be sized appropriately to handle these larger doors and larger vehicles. Another big decision to make when planning a new garage is whether or not to have it attached to the house. Though attached garages are the norm these days, there are several benefits to a detached garage. Particularly if you are accommodating unusually large vehicles, a detached garage may provide more flexibility in design. If you are replacing a garage door, the easiest way to determine the size you need is to simply measure the existing door. In the event you are adding a door to a garage without one, you will need to carefully measure the width and height of the opening. You will also need to check the clearance above the opening to ensure that there is sufficient room for the door tracks to be installed. This is assuming that you plan to buy and install the garage door yourself. If you are going to let a professional handle the job, it is best to let them determine the exact size of door you need. They can determine this at the same time they bid on the job. 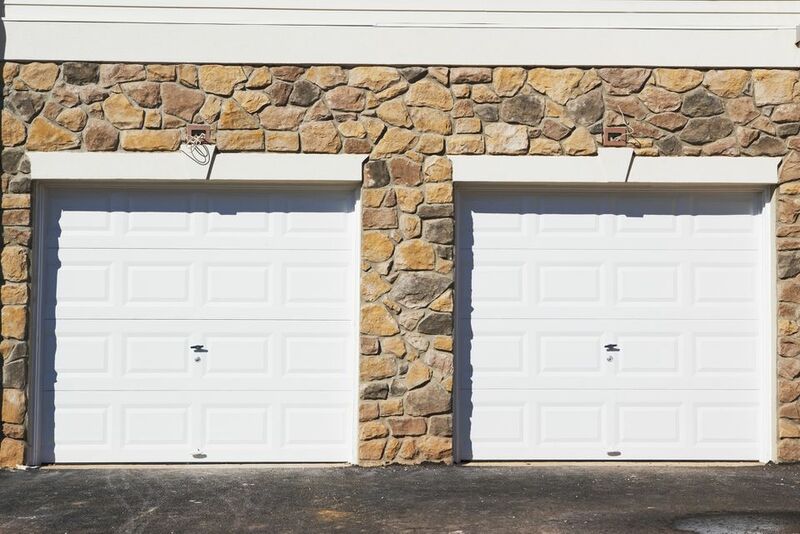 From a structural standpoint, it is fairly easy to reduce the size of the opening in a garage, thus creating the need for a smaller garage door. However, it is quite rare for anyone to want to do this. Much more often, homeowners seek to increase the garage door size to match vehicles that don't easily fit through the existing opening. Unfortunately, enlarging a garage door opening is often nearly impossible without substantially increasing the size of the garage. The biggest obstacle is usually the headroom above the existing opening. The span above the door opening is framed with a long header that supports the wall area above the door, and this header will need to be raised or rebuilt in order to increase the overall door size. If there isn't enough room above the opening, this can't be done without raising the roof of the garage. Although that is a complicated, big job, it is possible in the hands of a competent builder. You also need to consider allowing room for the garage door opener. You also need to account for the depth and width of the garage after the opening has been enlarged. Just because you can get your bigger vehicle through the doors does not mean you've really improved the garage. In fact, you may now have reduced the usable space on the sides and front of the garage in order to make your car easier to park. Sometimes the only way to make room for big vehicles is to retire the old garage and build a new one. With good design and careful construction, this can be a great improvement to the value and functionality of your home, provided you have a lot that is large enough to accommodate a new, larger garage. With enough available space, you can even wall in the existing garage and convert it to living space, then add an all-new garage sized in the way that works best for your needs. What Are the Benefits of a Detached Garage?